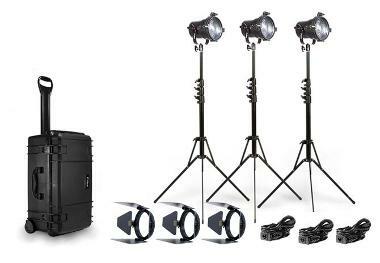 The Fiilex K304 Pro LED Kit uses unique dense matrix LED nodes inside Fresnel-style fixtures for continuous lighting that accepts Profoto speed rings and softboxes. This kit is built around three color tunable P360EX heads, which include a 20% increase in output from the original P360s from the Fiilex 301 LED Kit. It includes 3 P2Q Converters which hold 5 inch Fresnel Lenses to focus and intensify the center lux of each light by 8x. It also narrows the beam from 65 degrees to 14 degrees. The exceptionally easy-to-operate heads can be tilted or paired with the included barndoors. These lights offer full spectrum light quality without spiking or flickering and are small enough to be used for very tight scenes. This kit is ideal for 3 light interviews for documentary work, 3 point light setups for portrait work, chroma key work, and natural light filler/replication. • Accessories for the Fiilex 301 LED Kit may not be interchangeable with this kit. Plan accordingly if using both kits at once. • These lights require AC Power but can be battery powered through broadcast style batteries, battery plates, and DTap/PTap Cables for Fiilex brand lights.